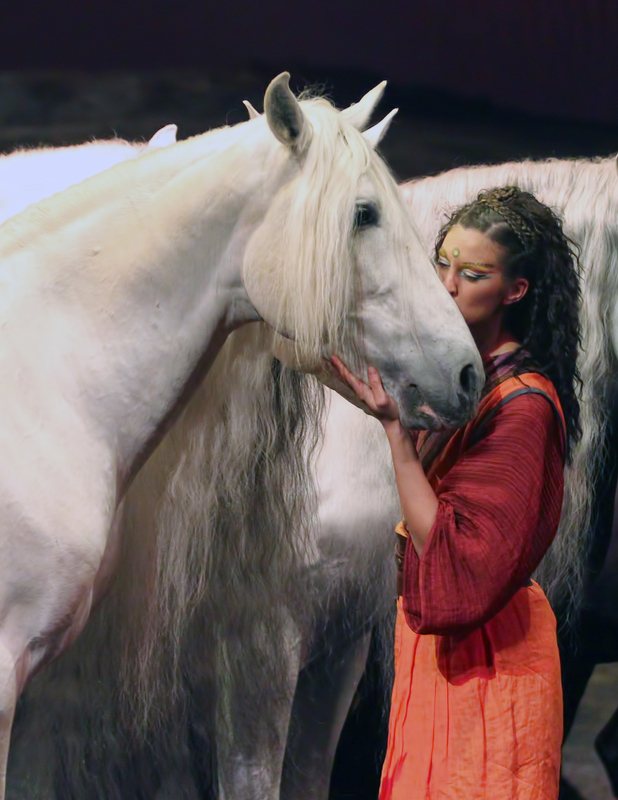 Breaking all kinds of records for touring shows, Odysseo is something that has to be seen to be believed. From start to finish this show bombards the senses with a series of impressive acts that are as beautiful as they are technically challenging. The true stars of the show are the 65 horses, ranging in age from three to 14, and representing 11 different breeds from seven countries. They are accompanied by 48 artists who respect their four legged co-stars and all work together to create a magical spectacle. Normand Latourelle, the visionary behind Cavalia, is a co-founder of Cirque du Soleil, and it shows. Similar to a Cirque du Soliel show, live music joins the production from platforms off to each side of the stage, there are always multiple stimuli to draw your attention and feed the senses, and the show blends elements of circus spectacle with the utmost artistic rigour. Picture a large scale Cirque du Soliel show with all its flashy production values, now combine that with the a horse show that includes world class dressage, trick riding, jumping, and choreographed routines. That only begins to describe the impact of Odysseo. 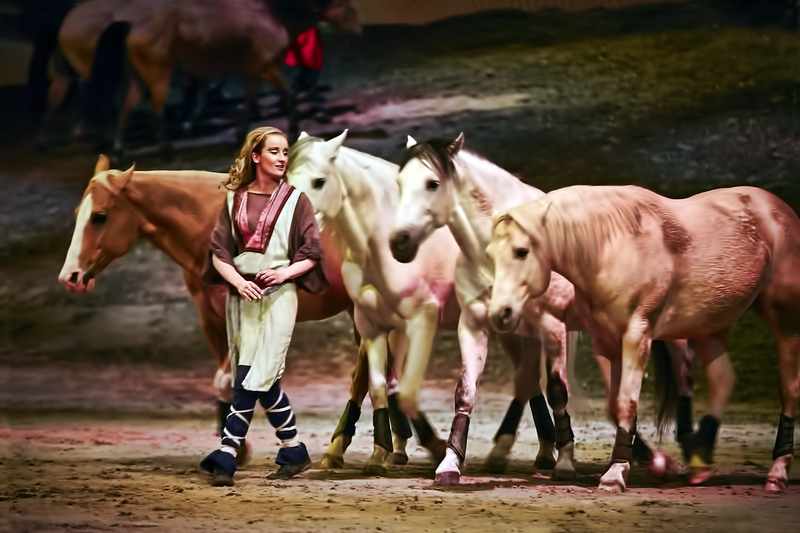 The show opens with a few horses slowly wandering onstage, their human partners unseen behind a curtain. After a few moments of peace and playfulness they are soon on the move, following their human leader as she guides them through an impressive choreographed sequence. It’s magical the way she can communicate directions to them with barely a word, and they follow beautifully. This serene scene is followed by the fairies, six performers riding a pair of horses, standing with one foot on each saddle. In their flowing white gowns, these trios wove ethereal patterns around the stage. Unique riding skills were also on display during the Nomads scene where truly impressive Cossack Riding had the crowd gasping. Flipping back and forth in the saddle, riding upside down with one foot in the stirrup, and standing on the saddle were just some of the tricks they performed. As with circus style shows, the difficulty is continually ramped up, and just when you’re sure they can’t possibly do anything more impressive — they do. One of my favourite things about this show is seeing the horses, free of any saddle, running with abandon around the stage. It’s difficult to describe the feeling that comes from seeing the freedom, power, and joy of wild horses running at full speed, and somehow that is captured in a stage show here. It’s almost impossible not to break into smiles as the horses come barrelling towards you. Then all of a sudden they are in formation, turning on a dime and dancing as a synchronized group. Aside from the beautiful horses, there is also a stunning array of acrobatic acts, and sometimes both share the stage as in the Angels scene. 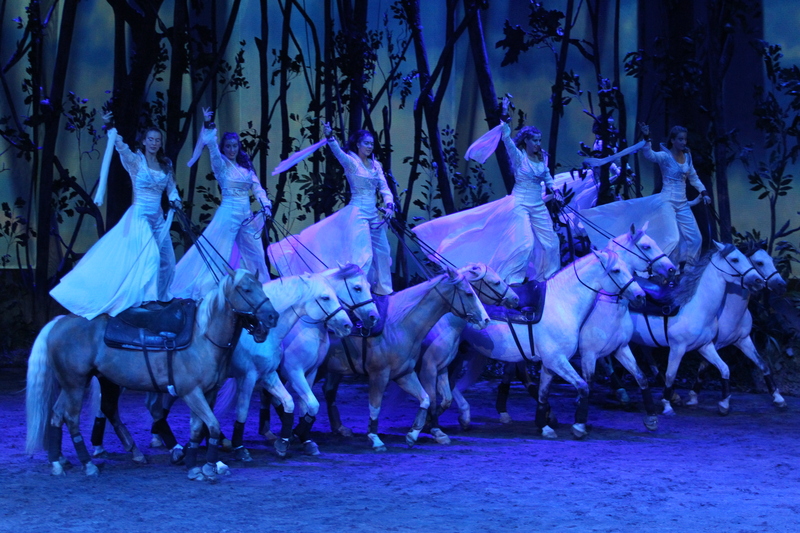 Four horses, carrying two performers each enter the stage, and the female acrobats, attached to white aerial silks, suddenly lift off from the horse as if they are flying. The four male riders then hold onto the silks and ride in a circle as the acrobats perform high above them. Another amazing acrobatic scene involves a fully functioning carousel that descends from above. Horses bring the acrobats on stage and leave them to perform their whimsical duets on the poles of the carousel. Another group of acrobats, featured in the “Call of Africa” scene perform human pyramids, flips, and tumbles, all with huge smiles. They get us to sing along to their song, “O Walu Guere Moufan” (no more war on earth), and bring a unique element of song and dance to the mix. With an expansive 1,626 square metre stage that has an inclined back portion, some scenes feel like looking out over a grand open plain. The Odyssey is one of those huge scenes, involving over 30 horses, grouped into threes or fours and following a rider as they walk around the stage in formation. The performers’ ability to lead these horses simply by walking with them and saying a few commands is unlike anything you’ve seen. The Grand Adventure is a similarly impressive scene that begins with one horse, up on the mound at the back of the stage, performing intricate dressage before being joined by a whole team of dressage riders. For the grand finale, the stage is flooded with water, adding yet another level of spectacle to the already massive undertaking. Gleaming white horses go splashing across the stage, acrobats dangle above the water, and the trick riders skim the surface as they hang off the side of their horse. There is so much packed into this show that it is hard to capture it all, but Odyseeo really is something that has to be seen to truly appreciate its grandeur and grace.